The future of packaging is now. Let’s make it count. | CREATIVE RETAIL PACKAGING, INC. THE FUTURE OF PACKAGING IS NOW. LET’S MAKE IT COUNT. Technology – More than ever before, technology stands to make an impact on packaging like we’ve never seen. We have drones delivering products directly to our doorstep, nanobots measuring our bodily systems, wearable technology guiding our daily habits, 3D printing on the rise, holographic employees to take our order, and facial recognition software to read our reactions. While all of this may seem like it was pulled directly from Minority Report, this is just a snippet of what is on the horizon. It’s being applied to consumerism and driving packaging design on a global scale. Sustainability – If you live in a city impacted by bag ban legislation, you are already privy to the growing influence that environmental concern has on packaging. While material selection continues to be a big factor in the sustainability dialog, the conversation is shifting more towards form, function, and the full life cycle of packaging. What will happen to the package at the end of its life? Does it even have an “end,” or can it live beyond the single-use stage (i.e., a carton that doubles as a planter)? Does it incorporate materials that otherwise would have gone to waste (i.e. excess material turned into handles)? The future of our planet depends on our ability as designers to find purposeful solutions that push packaging beyond the landfill, and we take this responsibility very seriously. Branding – In spite of the massive changes happening around us, one thing remains true: branding will continue to play a vital role in packaging design. Packaging is one of a brand's first opportunities to connect with consumers. In the absence of a 30-second commercial or a representative standing by your product, packaging has to do the job of both advertiser and sales person to stand out from the rest of the noise and close the deal. In the future, how we communicate a brand experience through packaging will be defined not merely by our five senses, but most importantly as a medium for self-expression. Alex Center, the lead designer at Coca Cola, said it best: “In today’s world, we have never been more connected, yet lonely at the same time. If you can find a way to connect with people on a personal level, you’ve won.” As consumers become more selective in their personal brand alignment, it is our job as designers to break through the clutter. We not only need to help consumers make the right choice at the shelf, but also create a brand platform that champions the consumer’s own identity. In short, we need to show we care, and mean it. Staying on top of the evolving trends in our industry is what keeps us in touch with the undulating landscape of consumerism. It’s part of our responsibility to our clients, and we look forward to practicing what we preach as we embark into the new year. Whether through technology, sustainability, or branding, our 2015 packaging resolution is to make it count. Future of Packaging Presentation, "Packaging is for people. Not Products." 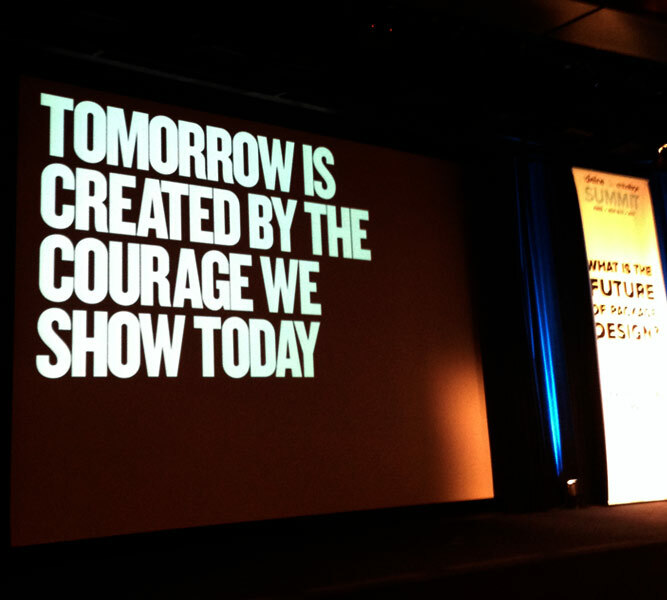 Future of Packaging Presentation, "Tomorrow is created by the courage we show today."